Chesney was wet but safe after harrowing swim in Nantucket Sound Monday. 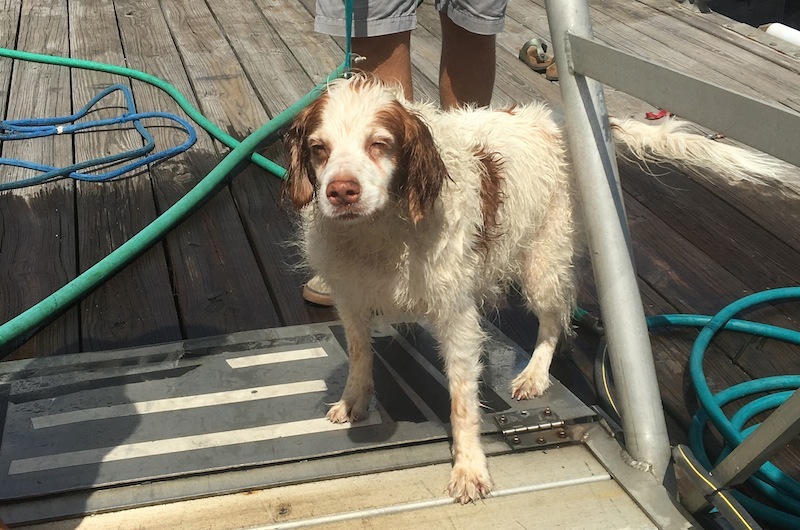 A female spaniel named Chesney was wet and tired but safe Monday morning after the captain of the commuter ferry Island Queen and the crew of a pleasure boat teamed up to save her from the chilly waters of Nantucket Sound. Chesney had fallen overboard from the Steamship Authority ferry Martha’s Vineyard en route to Woods Hole, it was discovered later. She was spotted by Capt. Ron Rock, who was at the helm of the Island Queen on the 10:30 a.m. run from Falmouth to Oak Bluffs. The ferry’s position was approximately a quarter mile east of Buoy 23; the time was 11 a.m., Captain Rock told the Gazette later. Chesney was about 100 yards off the port bow. He ordered his crew to emergency positions, but the Island Queen was too big to get close enough to save the dog. He saw a small pleasure craft, the Lovely Day, approximately a quarter mile away and signaled with the horn. Passengers aboard the Island Queen shouted to the boat as well. Lovely Day, a 25-foot Grady-White, was able to get close to the struggling dog and used a net to pull her out of the water. 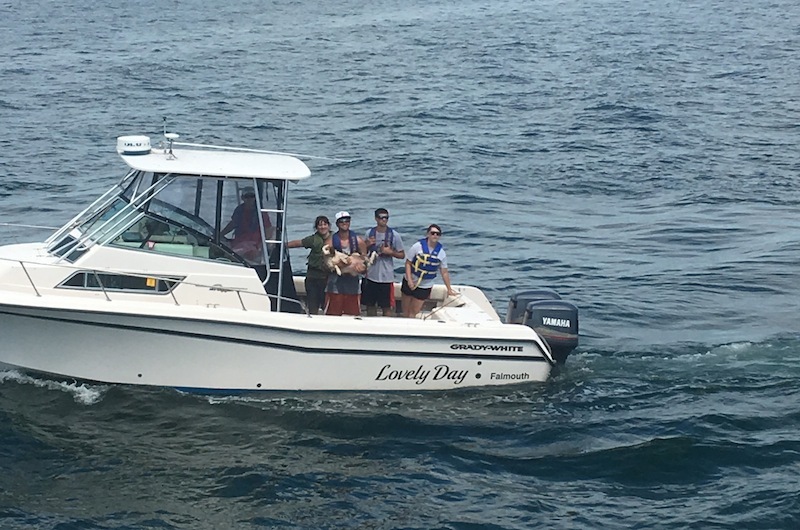 Leslie Souza, home on leave from the Marine Corps and vacationing with her family in Falmouth, had decided to come to the Vineyard Monday on the Island Queen, and witnessed the rescue. Ms. Souza said when her sister spotted the dog, she thought it was a seal. Once they realized it was a dog, everyone on the ferry gathered to watch the rescue attempts. As Captain Rock signaled with the horn, passengers aboard the Island Queen shouted and waved at the Lovely Day to get the crew’s attention, Ms. Souza said. Once the dog was hoisted into the boat, the ferry passengers cheered. When they arrived in Oak Bluffs, Island Queen passengers stood on the bulkhead cheering. 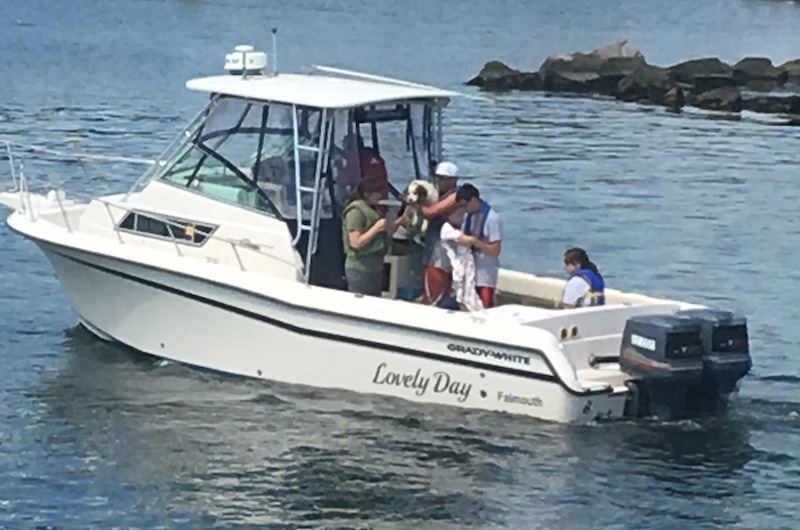 Rescuers aboard Lovely Day brought the dog into the Oak Bluffs harbor, where Captain Rock had alerted harbor master Todd Alexander and animal control officer Anthony Bendavid. Mr. Alexander greeted Chesney at the dock, rinsing her off and offering her food and water. She still had her collar and leash attached he said. He called the Steamship Authority to see if anyone was missing a dog. At first they said no, but then called back saying yes. Chesney’s family was searching for her aboard the ferry. Mr. Alexander transported Chesney in his own boat to the Falmouth harbor where she was reunited with her family. “The father, who apparently had the dog when it got loose, was not the most popular member of the family at the time,” Mr. Alexander said. The owners told Mr. Alexander that Chesney loves the water. The harbor master said it was lucky it was a calm day; if there had been whitecaps, the dog may not have been spotted. Captain Rock said he’s never seen a dog swimming in the Nantucket Sound, but he didn’t think twice about trying to save it. “That’s what we’d do for any person, any dog,” he said. Thank god it's a busy time for boating in the sound and it was spotted and rescued. Hopefully there is more to the story and the family alerted the crew when they realized their dog was gone, to try to find it ASAP. If not, the poor dog may be better off with a new home. we left the island last fall heading for pennsylvania without our cat. he got away from about two weeks before we left. we tried to get him back,to no avail.we set a trap etc. when we arrived on the vineyard in June we received a call from the shelter. someone had brought him in! he had spent all winter not far from our home in katana. he had lost a lot of weight.he was identified by his implanted identity. we took him to the vet to be checked out.he had survived the ordeal and except for a wound on his tail he is happy to be home. it was reported someone on martha's way called the shelter. thanks for making the call. Great story! We love the Island Queen family! Dogs Rule! What about a life jacket? They do make them for dogs! My thoughts exactly. Sure they had an eye on their kids though. How does a dog "go over" from one of the SSA ferries? If the family did not see it, where were they and who reported it? Exactly my thoughts. How does a dog jump the 3 foot high fence? When I read this it made my day., usually we are reminded almost daily of how bad the Human Race has become., then to see that so many stepped up to help this poor dog., just did it for me. I was so glad it turned out good, and I do believe that animals at Sea should have Life Preservers on., they drown just like us. Hats off to all involved. Does there always have to be someone to blame? The dog went into the water, the dog was saved (thankfully) the dog was reunited with its family (horay)--full stop. I agree! Give the guy and his family a break. It is a news story, not a feel good piece of fluff. The dog was rescued with his leash and collar attached. The owners did not see the dog go over. Where did the owners leave the dog? They were responsible for the animal. Maybe the feel good part of the story would be a new home for the dog. I totally agree with you, how could he have gone overboard with a 3 ft? Metal fence? Just saw this on NBC's Today Show at 8 AM this morning as well. It's making the headlines. WOW. I hope the owners of this precious Spaniel have learned their lesson......keeping a watchful eye on pets and children is an adult's responsibility at all times. I trust they are truly grateful for the pup's rescue and that there won't be a repeated incident. Poor puppy needs a warm bath and a reassuring dinner !! My sister, sister in law and I were on the ferry when this happened. For the captain to maneuver this huge vessel the way he did was just unbelievable. He did exactly what he was supposed to do and did not hesitate to move on. Thank goodness the Lovely Day was near by and also did everything to help out. We were all praying for this little guy getting to safety. Our first time in the Cape and will remember it for a long time. Special thanks to the Island Queen for having such a great crew on board that day. I have been to Martha's Vineyard and it is a lovely place. I have also owned a Brittany for 13 years. They are a wonderful family dog. It is great that both the ferry and the Lovely Day came to the rescue. However, the chances of this dog being spotted were very slim. Many dogs love the water so much they just want to jump off into it thinking they are in for a playful time. I have also owned schnauzers who have jump right out of a canoe while I was paddling it. I had no recourse but to jump in after them and rescue them. My schnauzers had no idea they were going to sink the minute they hit the water. The water was very glassy looking at the time and looked similar to a floor. I had no idea how much the water was exciting them. Luckily they began paddling. Schnauzers are not really water dogs! I really think dogs should be required to wear life vests especially on the open sea like that. The Brittany in the picture looks beyond exhausted. Thanks to some eagle eye passengers, the dog would have never have been saved. Thank God the Dog was spotted by a United States Marine. Good job Sgt Leslie Souza!! Leo McNee, Cape Coral Fl. My Brother Joe lives on your Cape and works on Your 'Island Queen Ferry'. He E-mailed us about it.....Great Job Captain Rock ! Featherstone’s first gallery show of the new year is a feast for four legs.